The rich, warm glow of your fireplace is truly one of the best parts about chilly fall and winter evenings. Listening to the crackle and snap of burning wood while watching flames flicker and dance can relax the weariest of us after a long day. Now back to reality for a moment. Sure, your fireplace is great—but only if you take care of it. Just like any other piece of equipment or appliance in your home, you must properly maintain it so it can continue doing its job. The National Fire Protection Association standards state that a qualified chimney sweep should perform a level 1 inspection on your fireplace at least once a year. A level 1 inspection involves inspecting the fireplace and chimney for damage, creosote deposits, and animal nests. Take note that a level 1 inspection includes the “readily accessible” portions of the chimney, but doesn’t include the use of special tools to access concealed areas of the chimney and its connections. Even though winter is over, now is the perfect time to schedule a qualified chimney sweep to perform a routine chimney inspection to prepare for cold weather next fall and winter. After inspecting your chimney, the qualified chimney sweep will advise you if it needs cleaning before using it next season. The presence of soot and creosote deposits on the inside of the chimney walls warrants a thorough cleaning, or “sweep”. Creosote, a brown or black tar-like substance, is a natural byproduct of burning wood. However, as it builds up inside the chimney it could ignite, causing damage not only to the chimney, but possibly to the rest of your home as well. The wetter or greener the wood you burn, the most creosote deposits will form, and the more often you’ll need to have your chimney cleaned. In the same way, the more wood you burn each year, the more often you’ll need to schedule a thorough cleaning. After inspecting your chimney, we may inform you of repairs needed to bring it up to safety standards. 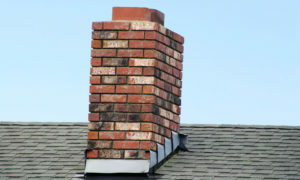 Potential problems requiring repair could include cracks in the chimney masonry; missing or damaged flashing at the chimney’s base; a chimney crown needing resealed; or a missing or damaged chimney cap. Neglecting to repair these kinds of chimney problems early on could hurt your wallet in the long run. Small problems have the potential to turn into big headaches and big money if ignored. BACK’s experienced technicians will give you a detailed estimate to repair any problems that could affect your chimney’s performance. Only burn seasoned firewood in your fireplace. Never burn lumber scraps, treated wood, or other debris. Doing so can allow harmful chemicals to enter your home’s living areas. In addition, burning wet wood will not only increase creosote deposits, you’ll likely end up with smoke inside your house as well. Ensure your chimney is fitted with a good quality chimney cap. A cap will keep animals and and foreign objects out of your chimney, as well as minimize downdrafts of cold air into your home. Keep the chimney damper closed when not in use. You don’t want warm air from inside going straight up the chimney and raising your heating costs. A small investment in a thorough chimney inspection—plus cleaning and repair as needed—will help ensure your fireplace continues to provide cozy warmth on chilly nights in a safe and efficient manner. Contact us today and we’ll schedule an appointment for one of our friendly, qualified technicians to come inspect your chimney. Designers Nicole & Alex Tell It All! Meet our Interior Designers!